The 2003 Natural Building Colloquium was held at the Black Range Lodge in Kingston, New Mexico, on the foothills of the Gila Mountains. It was a full week of connecting with old friends, making dozens of new acquaintances, learning more about a wide range of natural building techniques, teaching some about what I know, eating consistently gourmet vegetarian fair, soaking in a wood-fired hot tub, playing music and enjoying the lovely fall weather. With about 150 people attending, this event nearly doubled the size of the previous one three years ago. Most of the attendees were from the western U.S., but there were also 24 from the eastern U.S. and others from Canada, England, Denmark, Russia, Israel, Nicaragua, and Chile. I was delighted to find so many folks who are committed to making positive environmental changes through their building choices. Each morning we gathered in a big circle to introduce new people and get our bearings for the day's activities. There was always more to experience than any person could do, so we had tough choices to make. I will tell you about just a few of the events that I found especially significant. Perhaps the most important work is being done by a few individuals who are committed to bringing natural building techniques into the mainstream through incorporating them into established building codes. 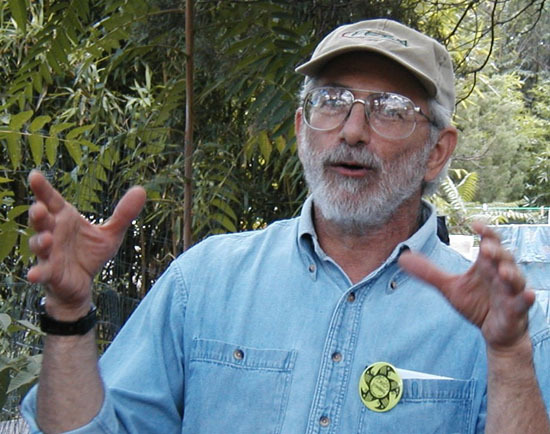 Outstanding in this arena is David Eisenberg of the Development Center for Appropriate Technology (www.dcat.net). David now has a regular column in Building Safety magazine, which is distributed to almost all of the building officials throughout the United States . He told us that he once addressed a huge audience of these officials at one of their conferences and told them that when people come to them seeking permission to build with sustainable materials and techniques, they should listen carefully and try to help them, because what they want is to preserve the world for all of our children! He is very well received by the building officials because he respects the caring that lies behind their concern for safety. 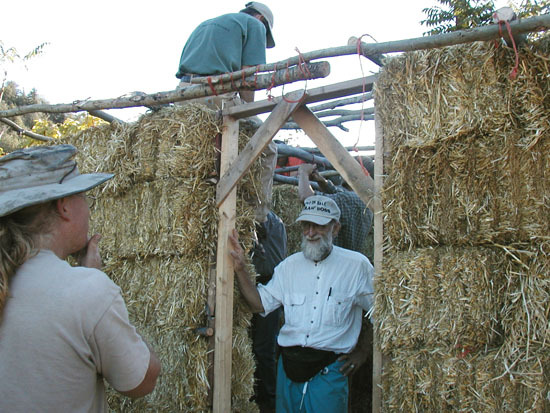 Among the original champions of strawbale building are Matts Myhrman and Judy Knox who not only presented a wonderful slide show about their work, but also conducted a workshop on building a temporary emergency shelter with straw. The building went up in just one day, complete with roof and door. The next day Matts demonstrated the use of a simple spray gun that can handle a wide range of natural plasters. I met Doni Kiffmeyer and Kaki Hunter, fellow earthbag enthusiasts from Moab, Utah. They embarked on a simple earthbag root cellar project on the first day and continued on with this through the week. Doni and Kaki have been working with bags for about as long as I, and have evolved some unique ways of doing things. I would periodically wander by "the hole" where the bag project was happening to see the progress, and was a bit surprised by how slowly it went. After a week's work with quite a bit of participation, the cellar was only about half done. I think that the degree of precision that they required slowed up the process considerably. 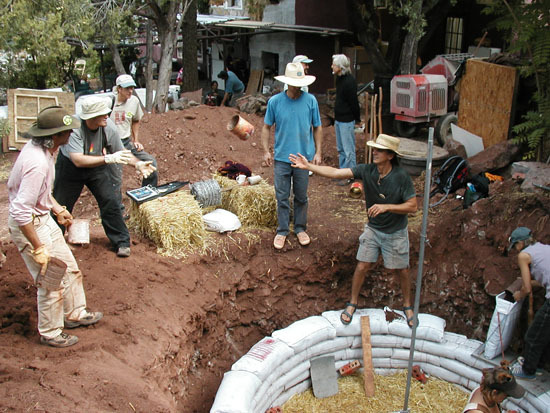 My recent experience in building the earthbag "glorieta" progressed perhaps eight times faster! Another week-long project that was successfully completed was the painting of the interior walls of a large meeting hall with a lovely coat of natural clay paint, or aliz. Four women experienced in this helped the workshop participants mix and apply the aliz. Carol Crews, one of the four, painted a large OM sign in the middle of one of the walls. 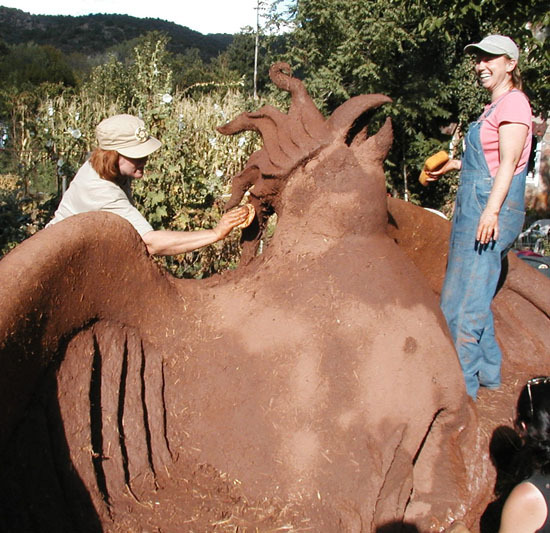 Ianto Evans and Linda Smiley of the Cob Cottage Company in Oregon returned from three years ago to lead more cobbers into the mud and straw that was applied to the repair of the great Phoenix, a sculpted oven and bench. This landmark of the Black Range Lodge is completely exposed to the elements and had suffered much erosion since its last repair. 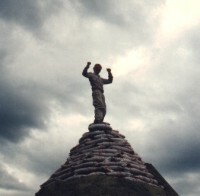 Several new cobbers were slathered in mud before the Phoenix arose again from decay. Architectural visionary Sun Ray Kelly inspired these new sculptors to wild excesses of expression. Ianto also explained how to build one of his "rocket stoves," which can heat up an interior bench very quickly to make a cozy warm place to snuggle on a cold winter's night. Ianto and Linda presented their ever-popular slide show on how man should imitate nature in architectural design. I have seen this show several times and am always inspired; it speaks directly to the right side of the brain with imagery and verse. I offered a simple demonstration of how to make papercrete with a little electric barrel mixer, and we applied this as a plaster over an old cob wall. I had never done this before, but it seemed to be adhering quite nicely. I also showed slides of my earthbag/papercrete house and a few other projects I have been involved with in Crestone. One of the wonderful surprises of the Colloquium was the presence of a group of Russians from Siberia . They represented several organizations dedicated to environmental or cultural preservation, and wanted to have some hand-on experience with natural building techniques. Accompanying them were two young American women who acted as very adept interpreters, and who also organized bringing the Russians here. They both work with the Sacred Earth Network, which was established in 1985, and has been especially involved with the protection of parks and indigenous groups and the introduction of renewable energy systems and sustainable living systems in the Altai region of Siberia . At first this Network tried to get the Siberians on-line, and now they are trying to get them off-grid. Local strawbale builder Paul Koppana of SkyHawk Construction has coordinated a strawbale workshop here with these same Siberians. Paul is involved with the Builders Without Borders organization and is interested in expanding natural building concepts internationally. 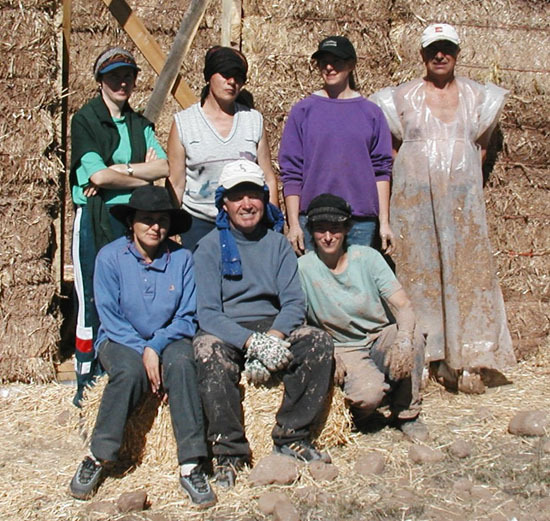 A grant from the Trust for Mutual Understanding provided funds to bring this group both to the Colloquium and to Crestone for further strawbale training. Back in Siberia, the Russians plan to implement their knowledge through various demonstration projects to showcase sustainable technologies. Igor has already begun building two passive solar houses; Tanya and Ludya want to build a public demonstration building in the Altai; and Victor is finishing a five story building that features various aspects of renewable energy. 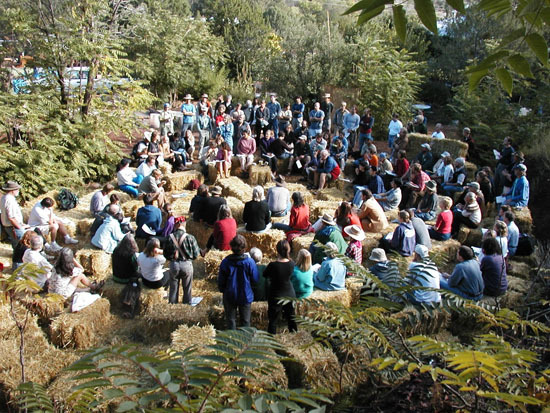 The Natural Building Colloquia have been important events in bringing together the diverse community of people interested in sustainable living. As a forum for sharing information about building technologies and embracing the entire spectrum of these concepts, these gatherings help forge a unity in our desire to fashion a more wholesome built environment.